After several months of interviews, research, meetings, workshops and design stages in the build up to the painting of the mural – followed by a week of hand painting by the Bread team (some long hours painting in the rain and the dark!) – we are happy to say that it is finally up. We are really happy with the response from the public and residents, we’ve had literally hundreds of messages, emails and encouraging comments – it’s great that so many others care about Hackney Wick as much as we do. We really enjoyed the painting experience and the opportunity it gave us to meet so many different people in the Wick. We deliberately designed the mural to be ambiguous and hopefully intriguing, in the hope that passersby would question the words and be interested to find out more about the history of the area. Many of the positive words that people gave us at the research stage, such as ‘creative’ and ‘community’ began to sound saccharine and also non-specific to Hackney Wick, so we chose to avoid these. The content has a mix of positive and negative connotations – we don’t advocate the products or factories etc mentioned (eg. ‘Fridge Mountain’ reminds us of an enormous rubbish dump) but we think it’s important to mention them all the same, as it reflects what went on before. The reason for focusing partly on the industrial history of the area is because this is what led to making it what it is today, in its geography, architecture and the current community. In the past, many people lived here to work nearby, and in recent decades, the artist community made its home here because of the cheap rent in a somewhat disconnected, barren landscape. We wanted the style to fit with the content, and we were inspired by the large-scale, traditional old typography on the old factory buildings in the area, much of which still stands today. On some of the walls we have also used more updated typefaces to give it a modern twist. The paint that we used is from the Forest Recycling Project (FRP) in Walthamstow, so this had some influence over the colours that we were able to use. We chose a range that seemed to fit with the graphics of yesteryear. 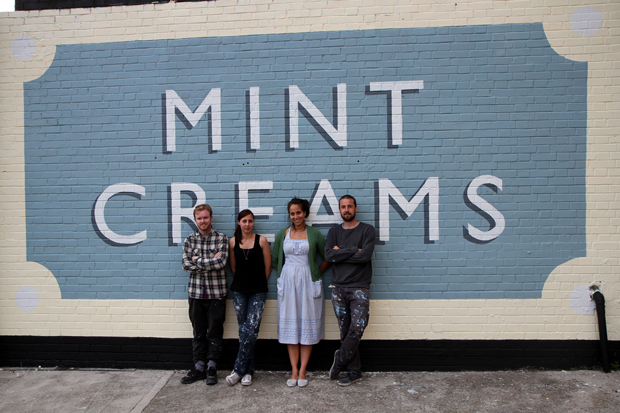 As the area is nowadays such a vibrant and creative centre, we wanted the mural to help make this immediately visible when you arrive in Hackney Wick. This project is also a pilot scheme, we’re hoping that if the wall is able to remain for any time, then the council will consider making more walls in Hackney Wick available for street art projects for other artists, as they do in places like Barcelona. Unfortunately, if they continue to be graffiti-ed over, then the council will continue to whitewash the walls, we’re aware it’s quite likely that this will happen.